Maybe, the best all-round island to travel to is Bay Canh (BảyCạnh), which is located at the east of Con Son (CônSơn) Island, Con Dao (CônĐảo) archipelago. Con Son Island has old growth forests, beautiful beaches, mangroves, sea turtles and coral reefs. 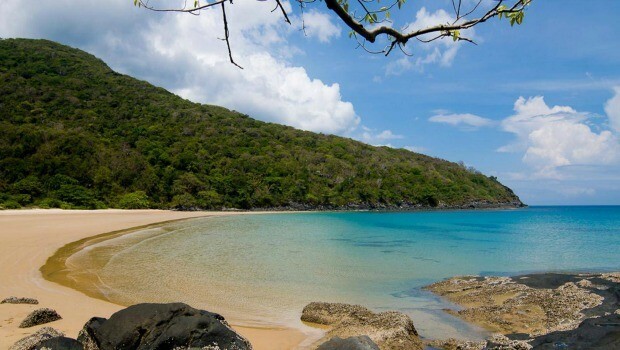 Bay Canh belongs to the archipelago of Con Dao, having an area of 683ha, including two parts that interconnect with each other by a sand bank right in the middle, named Cat Lon beach. It is estimated that there are 882 plants and 150 animals living on the island. There is a charming walk to a functioning French-era lighthouse built in 1884 on the eastern tip of Bay Canh, despite it just involves of 325 meters. When you stand at the summit, you will observe a breathtaking panoramic view. The marine resources in Bay Canh island are diverse, containing rich coral reefs, seaweed, fish living in the coral reefs, sea turtles, different species of clams, sea cucumbers, snails,… All of them were observed strictly and will delight your experience of diving. The coral here is very diverse with many species, which all belong to the Vietnam’s Red Book. In addition, a highlight of Bay CanhIsland is the mangrove ecosystem. The pristine mangrove is just approximately 5ha, but the existence of this mangrove also contributes to a comprehensive coherence with other ecosystems like tropical rainforest on high mountains and sea grass. Con Dao mangroves are distributed mainly on the dead coral soil, sand and soft clay. This is also a difference of Con Dao mangroves because when the water of tide withdraws, you can still walk easily in the mangroves, which are not muddy as elsewhere.Tourists could trek the mangrove to explore the ecosystem here.When the night falls, you can discover the life of a type of crab which is just living in Con Dao, named tank crabs. This species of crab is very shy towards humans; just hearing the footsteps on the leave carpets also makes them hide. This is the largest land crab species of Vietnam with the length up to 10 cm, malformed pincers that are different in terms of size but very strong and enough to cut the leaves and consume the plants. One interesting thing about this crab is that when the pincers are broken, they could still grow back. The scientists are still in the process of understanding, and identifying for this particular species of crab. Other highlights of Bay Canh island is the beautiful Cat Lon (CátLớn) beach which has charming white sand stretching, where sea turtles lay their eggs mostly in Con Dao. During the breeding season, from April to early September, there are just some turtles going to this beach for nesting each night. You have a chance to witness one of the wonders of the nature whilst watching turtles laying eggs. After that, you can take part in the process of conserving sea turtles here, such as bringing eggs carefully from the nest to the incubator area, and watching the lovely small turtles excitedly running to the sea.